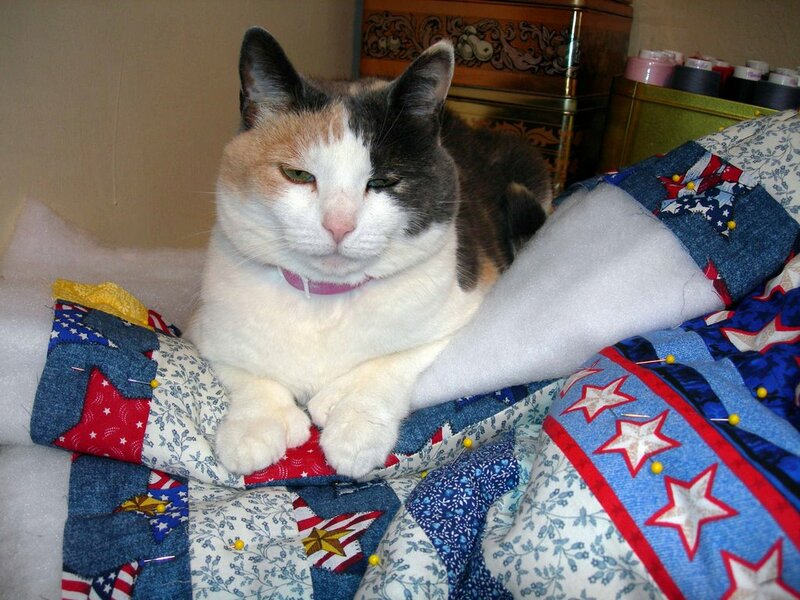 Every quilt has to be quality control tested before it is 1) cut out 2) sewn and 3) quilted. Usually, the testing apparatus used requires a 'four on the floor' and some form of a tail. It may be feline or canine or many other versions of animal life. I would be willing to bet that someone out there has a lizard or other reptile that is their quilting companion and official quilt tester! As someone, whose home has always been filled with animals, I have always loved them, as well. It was totally natural, that my three children would also love them and that our house would be filled with every kind of pet imaginable. 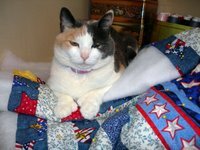 Currently, in this stage of our lives, we are down to 3 cats and all three adore laying on my quilts..at each and every stage of piecing, sewing and quilting. I know it will be a 'good one' when the cats refuse to get off...even as I sew! Paula, It is pretty amazing. What was more incredible was that I tugged and tugged and could not get her off. I machine quilted the whole lap quilt as a tug of war! On top of it all (pardon the pun), she was purring!